Denman Island. Denman Island is considered part of the Northern Gulf Islands and is also part of the Comox Valley Regional District on Vancouver Island. Denman boasts a small community of less than 1200 year-round residences and is linked to Vancouver Island by a short ferry ride across Baynes Sound. Much of Denman Island is covered by dense forest made up of Douglas-fir, western hemlock and western red cedar adding to the majestic feeling of the beaches and waterways that dominate the coastline. Since Denman was first mapped by the Europeans in 1791, it has been a favourite destination for sailors and vacationers alike. 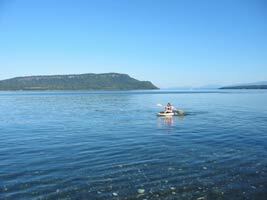 Sorry, there are no Denman Island BC Vacation Rentals currently available for your chosen search criteria. If you are not finding what you looking for, please give us a call and we would be happy to help you.